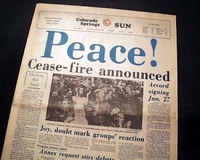 Shown is an original & historic old newspaper, offered to enhance your collectible interest: COLORADO SPRINGS SUN, January 24, 1973 * Vietnam War cease-fire accord * United States involvement ends The front page has a nice banner headline in blue lettering: "Peace !" 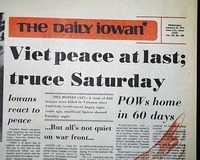 with: "Cease-fire announced" and related photo. More inside. Complete 1st section only with all 12 pages, nice condition. Great for display.